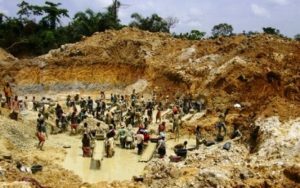 Minister-designate for Lands, Natural Resources and Forestry John Peter Amewu, has pledged to halt the operations of illegal Chinese miners in the country. According to him, most Chinese illegal miners in Ghana were using prospecting licences to mine. Speaking in interview with the media shortly after his nomination by President Akufo-Addo, Mr Amewu explained the foreigners must not mine with prospecting licences. He said his ministry would put measures in place to ensure that those with the right licences were allowed to mine. “We need to make sure that a licence made for prospecting must go for prospecting while a licence for development or authorization to develop must go with development. If we do this, the right people will be put in the right places to do the correct thing,” Mr. Amewu said. He said that illegal mining was a major canker in the country and that the youth were mostly involved. In view of that, Mr Amewu said government would work to eradicate illegal mining by building the capacity of those engaged in the activity to ensure sustainable mining. “If we are able to build their capacity, they should be able to do mining in a sustainable way. They must be taught to do things in the right way,” he added.